water gun and shoot other people in the eyes." 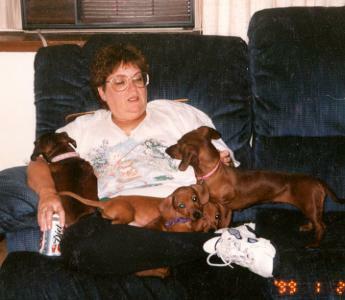 This is me with my lap full of dachshunds! I'm 49 years old and very happily married. I am a mother of one grown son and the grandmother of 4 brats. I have a step-daughter named Paula who is the mother of our youngest grandson. I love dogs. I have 6 of them! I was born and raised in Independence, Missouri. 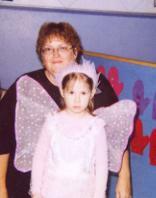 I attended Bristol Elementary, where my husband kissed me on the playground in 3rd grade. I attended Palmer Junior High School and then Van Horn High School. 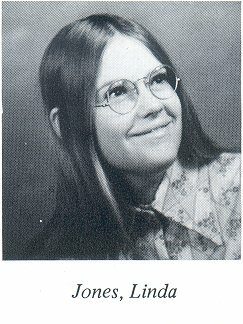 Above is my senior picture from high school. It is one of the best pictures I have ever had taken. It was taken in 1972. 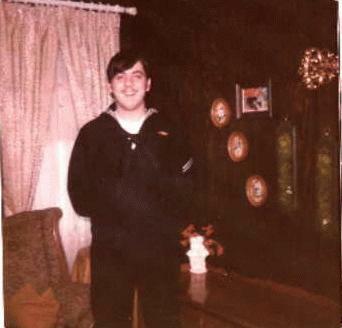 Below is a picture of David taken at my moms' in about 1971 when he was in the Navy. I love camping and swimming. I've done genealogy for over 25 years. I spend way too much time on the computer, LOL, mostly on Neopets. I love playing with my grandchildren and my dogs. My grandchildren are Troy age 13, AJ age 10, and Ariel age 7. 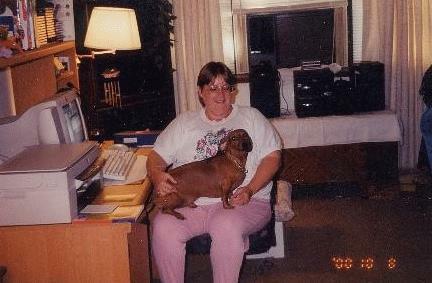 I have 5 dachshunds, Gretchen age 8, who is the mother of Peaches and Kiara, both age 6. The newest two are two of Kiara's sons, Gremlin and Oscar (named after his father.) They were born December 2001. I also have an 11 year old Australian Shepherd named Fuzzy, also known as Fuzzy Puppy. I love history, especially the Civil War era. I used to do Civil War reenacting. I also enjoy reading about the 1940s and I like trains, especially Steam trains. 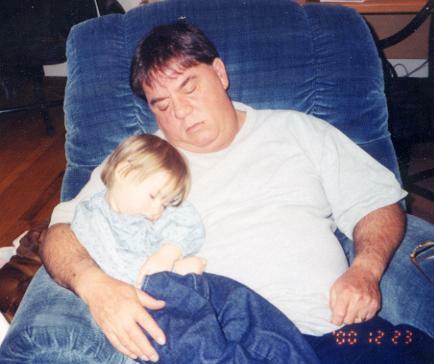 Below is a picture of the most wonderful husband in the world and our grandaughter Ariel, sleeping after a busy morning opening Christmas presents! 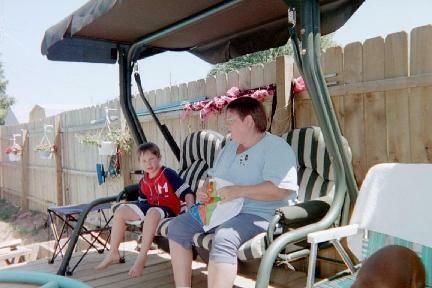 Below: AJ and I on the swing on the deck in summer 2001.